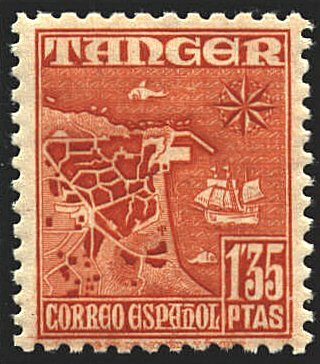 The site of Tangier has a long history of habitation, going back to the Phoenicians. The Roman settlement, Tingis, became a free city in 42 a.d. and became the provincial capital of Mauretania Tingitana. The city was occupied by the Romans, Vandals, and Byzantines. It was ruled by Islamic dynasties from about 700 to 1475. Then by the Spanish and Portuguese until 1662, when it was transferred to the English as a part of Catherine of Braganza of Portugal's dowry. The map shown on the stamp is believed, by some, to date from the 17th century, and to show the city as it was then. Others believe that it is a modern attempt to create and "old" map. During the English period, 1662 to 1684, the mole shown in the harbor was built, but the improvements outside the walls of the city were not in existence then.